We’ve heard from several of you that you were beginning to wonder Steve’s whereabouts since it’s been several days. Stephanie and I left last Friday evening, June 24, and drove westward, stopping in Lone Tree, Iowa to spend the night with my sister, brother-in-law, niece, and nephew. On Saturday we made it as far as Ogallala, Nebraska after Stephanie negotiated our van fantastically through a pounding thunderstorm. On Friday, Steve went from Jeffrey City, the ghost town, to Rawlins, WY and rode 69 miles. On Saturday he rode from Rawlins to Riverside, WY for 62.2 miles. Then on Sunday, June 26, we came across a handsome bicyclist..yes…it was Steve… on Colorado Route 175 near Cowdrey, Colorado. We knew that we were going to meet Steve in Walden and suspected that perhaps we’d even see him cycling! We came from the northeast on another road that intersects 175. From Cowdrey he had another 7 miles to Walden. Well, he said that he has never, ever in all his years and miles and conditions of bicycling experienced anything as WINDY and challenging as those 7 miles. The wind was either in his face or coming as a crosswind. Having 60 pounds of pannier weight clinging to the bike only makes more surface area for the wind to abuse. He managed to ride 49.8 miles despite the awful wind. We spent the night in the North Park motel, which appears to cater to the rodeo and trans-America bicycling crowd. While heading through town later that evening we came across Deren, Steve’s acquaintance who he met several days earlier who is also cycling across the U.S. The cross-country biking world seems to be getting smaller for Steve!! 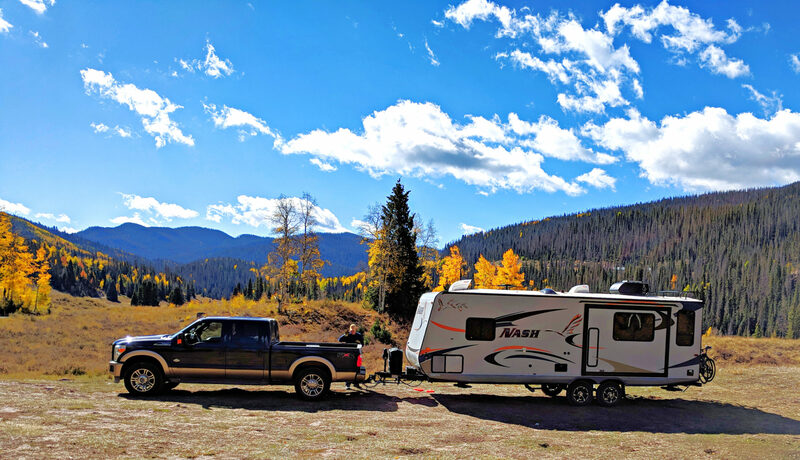 Steve left Rand and went onto Stillwater National Campground, 5 miles south of Grand Lake. His mileage for the day was 65.4 miles. Stephanie and I had driven ahead to find a campground and this one was very nice. Our campsite overlooked Shadow Mountain Lake and the marina. It was set among the pine trees with a spot for our two small tents, a picnic table, a fire ring, and a short walk to the flush toilets. When tent camping, the important things in life flush or have warm water. They even had a shower house. Yeah! We were fortunate to have a family next to us leave who offered us the rest of their firewood. In fact, she was formerly from Emmetsburg and Des Moines, Iowa and she and her husband are riding in RAGBRAI (the bike ride across Iowa that takes place the 3rd week of July each year). After dinner in Grand Lake we came back to start a roaring camp fire, enjoy some long talks, and roast marshmallows for yummy s’mores. Yesterday, June 28, was a BIG day for Steve. This is the day for which Steve has waited a year. Last year he rode in Ride the Rockies and the second day of the ride was cancelled due to snow and ice on Trail Ridge Road. The organizers of the Ride had to transport cyclists, bicycles, and all of their gear from Estes Park to Grand Lake via buses and cargo vans. He and many cyclists were very disappointed for their BIG climb for the week was not to be done. So, when he planned his route for the summer, he definitely had Trail Ridge Road as part of his ride. He left the campsite about 8:45 A.M. and headed off to Grand Lake and Rocky Mountain National Park beyond it. Trail Ridge Road is a 46 mile long road that ascends to 12,183 feet of elevation and is the highest continuous highway in North America. While he biked, Stephanie and I rented kayaks and paddled the circumference of Grand Lake about 6 miles. It was beautiful with the surrounding mountain ranges, the reflection of the snowcapped peaks in the water, the quaint and not-so-quaint cottages lining the lake, and the scent of pines as it wafted past us. I was reluctant to attempt kayaking, but Stephanie quickly reassured me that it was pretty tame. And, it was awesome. With the kayak, I just sat down inside on a very comfortably padded seat, adjusted the foot pedals to fit my legs, leaned back as if in a recliner, and paddled away. This type of kayak is not the type one would see in river rapids as they aren’t designed to go upside down and around again. Thank goodness! Being done with kayaking, Steph and I drove into Rocky Mountain National with a quest of locating Steve and appreciating the beautiful, gorgeous, awesome scenery that our Creator has given to us. Well, we pulled into the visitors center parking lot to find Steve with his bike leaned against a wall. He was enjoying a peanut butter and bagel sandwich and busily fielding questions from passers-by. I have to tell you, it was an emotional moment for me to see him there as I knew that he was fulfilling his dream that was dashed a year ago. Steph and I continued on from the visitors center, again on a mission to locate a motel this time. We found a room at the Twin Owls Motor Lodge on the edge of town that placed Steve just bike strokes from Colorado Route 7, which goes towards Boulder. We met up with Steve at Starbucks in Estes Park after he rode 53.8 miles!! He DID IT!!! Yeah!!! Yesterday we also made cell phone contact with a friend from Batavia, Tyler, who was formerly in our high school youth group. He’s in college now and emailed me last week that he was going to be vacationing in Estes Park this week and could we hook up with him. It was great to have dinner and a nice visit with him last night. In fact it was a perfect ending to the day to see a friend! This morning Steph and I have enjoyed a leisurely pace, sleeping in, watching TV, and now spending some time at a coffee house with internet access. After we’re done here we’re going for a hike somewhere. There are so many options, but we’re probably up for a 3-4 mile easier hike today. Steve is enroute to Boulder today and will bike from Boulder to his parents’ home in Centennial tomorrow. Hope you’re all doing fine! ~~ Toodles…Diane. Sorry but I have not had a chance to write since the day has come for us to take off for Italy. At this point, going to Italy does not seem as adventerous as biking and driving across the US. I will still do this one day, (drive, not bike). You see, going up the hill from S. Forest to Pine Street is an effort for me!!! What a wimp. Keep the info coming. I am going to try to get on line at some point. If not, I will have a lot to read when I get home. Keep the journals coming.